Way before the Prius and the Civic Hybrid, the original hybrid was Pink Champale. We call it a hybrid because it looks a lot like Champagne (sort of) — but it’s really beer. In tiny print, the label says it is a Malt Beverage with Natural Flavors and Artificial Color. Champale has certainly stood the test of time; the above approval is from this year and Gono.com has an excellent collection of Champale ads going all the way back to 1960. The above ad is from about 1978, and the 1962 ad refers directly to Champagne. Smirnoff Ice is a much later example of the increasingly common trend toward hybrids (it has a malt beverage base but a hugely famous spirits brand name). The beer versus wine versus spirits categorization is a critically important part of TTB’s role, because of a dramatically different excise tax on each category. In many cases (such as beers loaded up with flavors) it is very difficult to assign the product to the most appropriate category. Should I run out and lockdown “Champipple” Sanford’s blend of choice for all black tie affairs, Champagne and Ripple? Only if you are dressed appropriately. I’m a newbie to this form, and thank you in advance for any assistance. We moved to Pearland, Texas (southern suburb of Houston, Texas), and I cannot find Champale. Hopefully, some member of this forum can provide me with some direction. I have pretty much exhausted my avenues – I have Goggled, yahooed, mozillaed, you name it, I have “ed” it. Any help will be graciously received. Thanks again. Contact your local Pabst distributor. I do believe, however, that while they own the label, the brand is not currently in production. Years ago I use to buy Champale in California and then it was just gone. I live in North Las Vegas, Nevada and wonder if there is any place I can order the “green” bottles of Champale? Does it even exist anymore ? Looking for places to buy Champale in Richmond, VA area. Please, Has been many years since I have seen it and would like to get re-acquainted. Where can one find this Champale? you can find it in philly……. WHERE CAN CHAMPALE BE PURCHASED IN AMERICA IN THE GREEN BOTTLES? DOES ANYONE KNOW? I live in South-west Virginia and I can’t find it either. I’ve decided to e-mail Pabst and ask them what the situation is. I’ve gone too long with no Champale. Does anyone know of a link that may have a recipe for a brew that might taste similiar? Are there any products on the market now that taste like Pink Champale? steve did u hear back from pabst?!? i been trying to find champale since piggly wiggly stopped having it. i’m in kansas so if u tlak to then PLEASE ask if they will send some to kansas!1 or i might make my own lol! I FOUND PINK IN WEST VA ABOUT 7 OR 8 YEARS AGO.THE GREEN BOTTLE IS THE BEST.I GOT STARTED ON IT IN FLORDIA IN 1970. I’VE LOOKED IN MOST EAST COAST STATES SINCE. NO LUCK. you guys are not looking hard enough i found a whole daggone mess of champale and buy some every week. i dont want to give up my source to all of the world wide web but send me a mail and i will let you know where you can get you some champale. I still buy the golden champale in Atlanta Ga and Augusta Ga and they come in 6packs now not the original 4pack. Where did you purchase Champale in Atlanta? Hey Billy, please let me know where I can find the Pink and Golden Champale products. I sure would appreciate it. Please inform me where I can buy champale, thank you! I would love to know where I can buy Champale! Back in the 70’s it wasn’t everywhere in the Milwaukee area you just had to be in a certain or go to a certain demographic to find. I live in Carthage Tx anybody no where i can morder a case online or by at a store close to me please give me a calle 903 831 7431 or email me please give tried all these wine and beber websites and nobody has it for sale HELP!! Billy, did you find Champale in Houston? I don’t know how to email you direct. I just came from Puerto Rico. They sell Pink Champale in a lot of places. I had several Pink Champale during my 10 days in the island. billy, please send info on where to buy pink champale. thank you. Maybe I’ve seen it elsewhere before and missed it, because the bottle does look a lot like the Miller Genuine Draft Bottle. But in any case, there you have it. We’ve created a Facebook group called Bring Back Champale for anyone interested. If we get enough response we might be able to get a production run started again. Wow guys I got liek 20 BILLION mails about champail so I guess I better let yall know where I got it before I get SPAM on my PC. it is at Tick tock Liqiour in Hyatsville Maryland. The pink and originel is their. Tell them that Billy and Rickywayne sent you beacause if you buy any they might give me a free gift card to Marshalls and i need a new hat. Where can I find extra dry CHAMPALE Near Newport News, VA 23608? I found the Golden Champale at a deli this past Tuesday in Philly. The clerk said that they stopped making the pink, but my sister swears that she got it there last summer. The Golden now comes in a clear bottle, 24oz size, & costs $3. Loved every drop, as I was listening to Prince & the Batman cd!!! Anyone run into Malt Duck??? I feel the same in alabama,can’t find it any more as of last year I was able to but it in all favors, what happening with the company that distributes it, we want it back, please keep the same taste and the original look don’t change any thing. I looked all over the web my damnself and there’s only one place. Super Wine Warehouse. I was told Pabst still makes it once a month but I highly doubt it. They want 5.00 dollars for a four pack and shipping is mad crazy. I quoted him on a case (24) of 12oz. bottles shipped to PA and they wanted 70.00 dollars for the shipping plus the 30.00 dollars for the product. I love Champale but I’ll pass. I even emailed Lion Brewery in PA ( they made and bottled Champale here) and they said that they don’t bottle for Pabst/Champale anymore. Anybody in Pennsylvania know where I can buy at least six cases of this for a 70s party I’m having in July ? Any info is much appreciated. Malt Duck was the shizznit. They haven’t made this since the late 80s. They had the regular, Apple and grape. Everybody has different taste buds but I loved the Apple flavor. Many liked the grape. If anybody wanted to try a flavored malt drink, go with the St. Ides Special Brew….lol. Would like to know where Champale can currently be found. Anyone out there know of any place in Texas this beverage can be found? Would like to know where Champale can currently be found in Texas. Any responses? I inherited a box of Champail from my cousin so let me know who is up for sharing it. I am in Texas and I would love to know where I can find Golden Champale. I live in Pueblo, Colorado. How can I get some Champale here? San Juan, P.R., 1979, Disco party at some kid’s neighborhood carport or garage. drink of the day? pink champale! that was the chick drink of the time. Where can I find Golden Champale in Orlando Florida ? where can i find champale flavored palcohol? We are all in the same boat. Would love to have some Champale… Pink that is. I’m the one originally asking to find pink champale because dad bought it for me underage at 18. I want more in the bottles. Is there??? 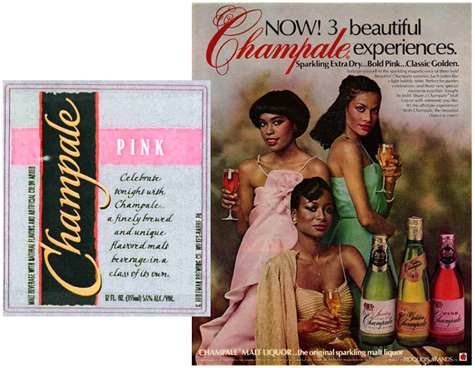 I sure do remember Champale in mid 1970’s, right through the 80’s…..it was a “Faux Champagne” of sorts. Often dubbed “Ghetto Champagne” because it was marketed and popular with blacks and Hispanics (called Chicanos back then. )It was actually quite good ! Once at a fancy dinner party, I served the extra-dry variety in fancy crystal champagne glasses (and hid the bottles !) Everyone loved it and complimented me on how good the “champagne” was ! It actually was an malt ale product that was fermented the same way wine is. Therefore, it did taste like fine sparking wine more than a beer or ale. It is all in perception and presentation. Where is it today ? They claim Pabst still makes it….but I have not seen it in decades. Does anyone out there know where they sell it today? Some blogs claim it is still available ,but only in Georgia and Puerto Rico, but I cannot even confirm that is true ? MANY of us want some Champale and it seems like many bodegas and corner convenience stores carry it here on the East coast, especially in Jersey and New York. Instead of us looking for it in blogs, some need to call or locate a few of these stores that sell Champale and get in touch with the distributor who delivers it and you can simply know where to find it and have it possibly shipped to you instead of having Super Wine Warehouse charge you an arm and a leg for shipping it. Nothing wrong with paying 30.00 dollars for the case of Champale but I’m not getting my head beat in due to the shipping costs. Again, if someone in my state of Pennsylvania knows where to find Champale, let me know ASAP. Anyone know where I can find Pink Champale in Louisiana? In the New Orleans area. where can i find champale malt liquor in ks. I loved champelle! Please notify me if you find out if production begins again! Where can I find the champelle in Louisiana?